The Jackson 5: Sage: It's what cute is. I couldn't resist putting Sage in her bikini so I could get a snapshot of her splashing in the tub! 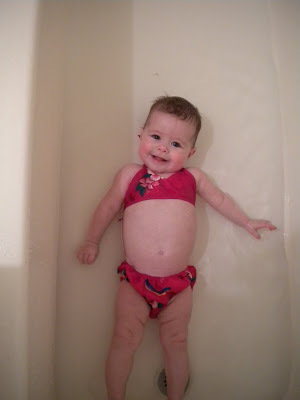 I think it's time we take this kiddo swimming..she LOVES the water almost as much as I love her in this swimsuit. She does have feet..I promise..I'm just a bad picture taker.